During an episode of acid reflux, you may experience regurgitation, the sensation of acid backing up into your throat or mouth. It may be coupled with an unpleasant sour or bitter taste, or “wet burp.” Other symptoms include chronic coughing, laryngitis, new or worsening asthma, and disrupted sleep (x). Heartburn is a burning ache in your chest that occurs shortly after eating a meal. The pain may worsen if you bend over or lie down, and often causes a sour or bitter taste in your mouth. While heartburn is usually localized to the upper gut, it can move up the abdomen and into the chest, occasionally rising up into the throat (x). Severe heartburn can even feel like the pain associated with cardiac arrest. So how do you know you’re suffering from heartburn and not a heart attack? A heart attack causes different symptoms like shortness of breath, fatigue, chills and cold sweats, dizziness, and nausea. If you experience any of these symptoms, seek medical care immediately (x). 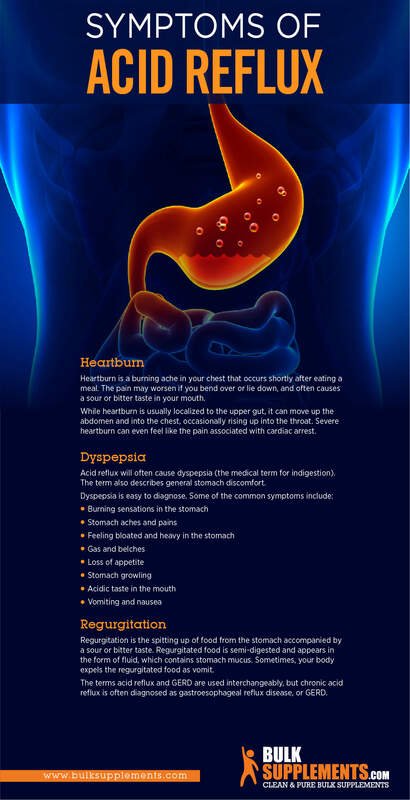 Acid reflux will often cause dyspepsia (the medical term for indigestion). The term also describes general stomach discomfort. Other factors like excess alcohol consumption, drug intake, or emotional upset may also cause dyspepsia. Regurgitation is the spitting up of food from the stomach accompanied by a sour or bitter taste. Regurgitated food is semi-digested and appears in the form of fluid, which contains stomach mucus. Sometimes, your body expels the regurgitated food as vomit (x). The terms acid reflux and GERD are used interchangeably, but chronic acid reflux is often diagnosed as gastroesophageal reflux disease, or GERD. Acid reflux may have one or more underlying causes. The most common cause is the weakening of the sphincter muscle–the valve in your stomach called the lower esophageal sphincter (LES). Normally, the LES closes off and prevents the contents of your stomach from flowing back up. However, in those with acid re flux, the LES may relax, releasing food back into your esophagus. So what causes the LES to weaken? Pain relievers like ibuprofen, blood pressure medicine, or muscle relaxants can weaken the LES (x) Smoking, drinking, or eating fatty foods can cause or worsen acid reflux. Excessive stress and anxiety can also aggravate GERD symptoms. One common cause of a weakened LES is an abnormality called the hiatal hernia. People suffering from this condition have a slightly displaced gut. Normally, the LES and the upper part of the stomach are located below the diaphragm, but in people with a hiatal hernia, the upper part of the stomach and the lower part of the esophagus move above the diaphragm. This can cause the acid to rise above its usual level and travel back up the esophagus (x)(x)(x). You can easily treat acid reflux with over-the-counter antacids that neutralize stomach acid. Antacids can help relieve upset stomach, heartburn and acid indigestion. 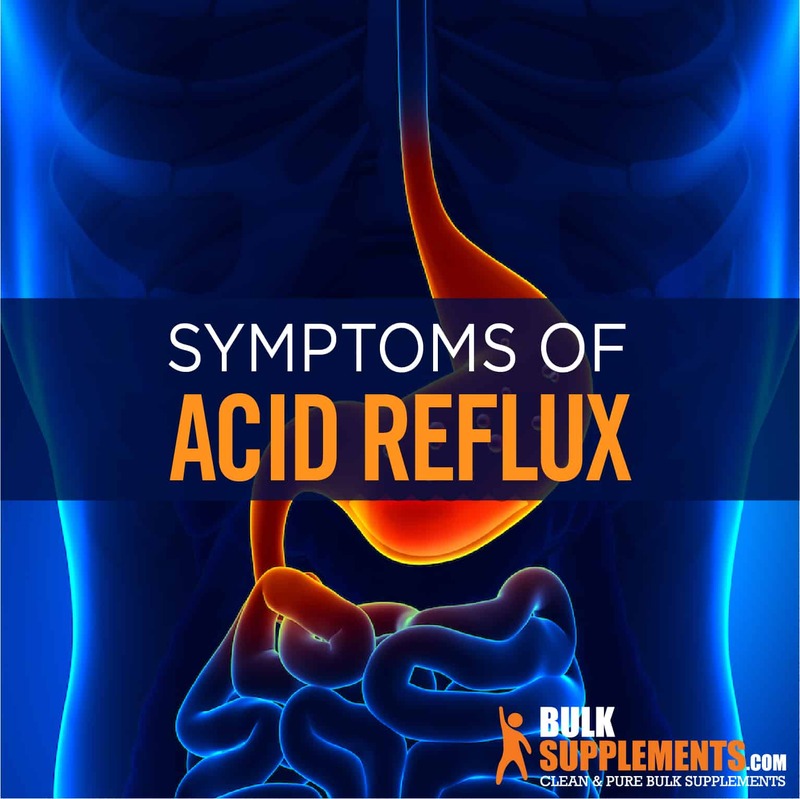 Sometimes, antacids alone can’t fix the problem, particularly if you’ve been diagnosed with GERD (gastroesophageal reflux disease); a chronic, extreme form of acid re flux. Doctors may diagnose you with GERD if your acid re flux occurs frequently or causes inflammation in your esophagus. Symptoms of GERD include severe chest pain (also called angina), heartburn, and acid regurgitation. GERD can also cause or worsen asthma, and if left untreated, can lead to chronic coughing, sore throat, laryngitis and hoarseness (x). If you experience GERD symptoms paired with regular vomiting or difficulty breathing and swallowing, consult your doctor as soon as possible–it could be a sign of a more serious medical condition (x). Proton pump inhibitors (commonly known as antacids) treat acid re flux by actively blocking and reducing the amount of acid produced by the stomach. Be sure to talk to your doctor before taking antacids for a prolonged period of time: a number of studies have linked long-term use of PPIs to a range of potential health risks including kidney disease, stomach infections, heart disease, pneumonia, and dementia (x). 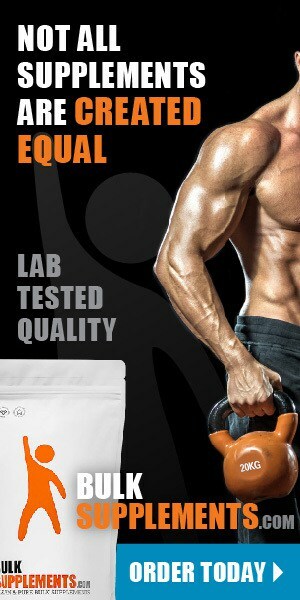 Short-term use, however, is generally recognized as safe. Diet plays an incredibly important role in triggering, preventing and relieving the symptoms of acid reflux. The prolonged presence of acid in the esophagus can lead to a host of severe conditions. People who suffer from acid reflux or GERD may want to avoid certain foods that could trigger symptoms. Which foods worsen acid reflux? Fatty meats like beef, pork and lamb tend to be quite high in cholesterol and fatty acids, which can trigger acid reflux (x). Other high-fat foods that may trigger heartburn include avocados, cheese, and nuts (x). While scientists don’t yet understand why, consuming salty foods can also trigger heartburn. Those who regularly add salt to their food are 70 percent more likely to develop GERD than those who do not (x). To curb acid reflux, focus on making healthy diet and lifestyle changes. Avoid foods that trigger heartburn: fatty, fried, or spicy foods, citrus fruits, garlic, onions and chocolate. Eat smaller meals throughout the day, rather than a large meal later in the day. Rest at a slight incline instead of lying flat, as maintaining an upright posture can help control acid reflux. And don’t lie down within three hours of eating–acid production is at its peak during that period. Overweight individuals are more likely to experience acid reflux than those who are not overweight. Losing weight can significantly reduce your chances of developing GERD or heartburn (x). In rare cases, surgery may be required to reverse acid reflux damage (x). Switch to lower-acidic, alkaline foods that prevent the buildup of acid in your stomach. Fermented foods like yogurt and kimchi are rich in probiotics, help improve digestion and increase the presence of good bacteria. Foods like ginger and aloe vera reduce inflammation and soothe the gastrointestinal tract to combat acid reflux (x). Taking over-the-counter antacids like Gelusil and Mylanta will decrease the amount of acid in your stomach. H2 blockers like cimetidine and ranitidine will also reduce acid production. Proton pump inhibitors like lansoprazole (Prevacid 24 HR) and esomeprazole (Nexium) also block acid production in the stomach (x). If you’re suffering from chronic acid reflux, a trained healthcare professional can diagnose and treat your condition. Alternative home remedies may not alleviate prolonged acid reflux and could even lead to severe health complications.